Standalone extension which adds a CSS customizable buy now button on every product page. 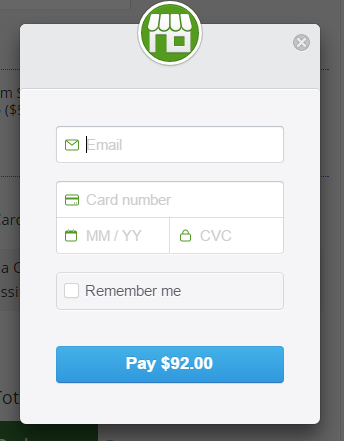 Once the user clicks the checkout button the Stripe Checkout top layer will show up. The customer will fill all the credit card data and click pay. Once the payment is processed the top layer will disappear and the user will be redirected to the thank you page. The user completes the whole payment process without leaving your website. All the credit card info is passed directly to the Stripe servers without reaching your server. As long as you are using SSL certificate and Stripe Checkout the rest of the PCI DSS guidelines is handled by Stripe. You can read more for details. If Stripe is supported in your country, you’ll be able to accept payments from customers anywhere in the world. See which countries Stripe supports.